At Darkives.com, we are always looking for ways to improve our posts. Darkives Project Manager, Ashley Ryan, sent me a summary of the Epic Soliloquy Series. 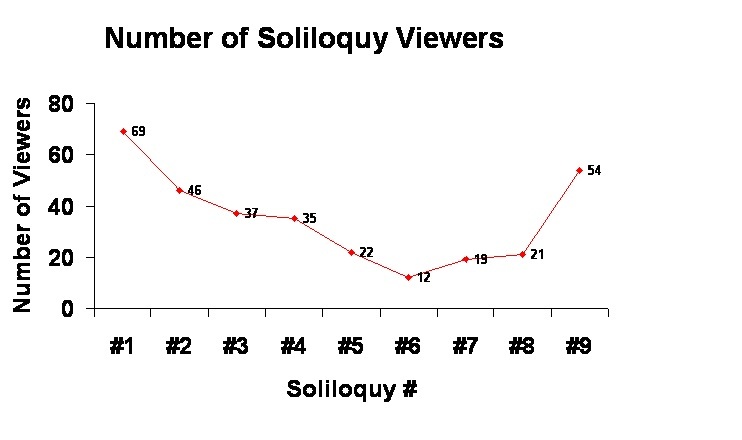 We see there is a slow and steady decline from Soliloquy #1 to Soliloquy #6. Interest is again peaked by video number 7, and as predicted, the announcement of video number 9 being the last soliloquy brought a sharp increase in viewership to 54 (second highest behind the first video). 1) Don’t do such a long series.